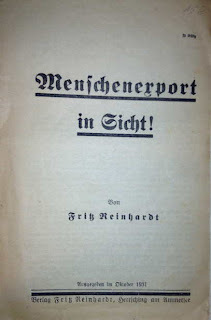 Fritz Reinhardt was a significant figure in Nazi propaganda. Before 1933 he instituted a correspondence school that trained about 6,000 Nazi speakers. He issued a barrage of material to support those speakers. In 1929 he issued a pamphlet claiming that under the Young Plan, an international agreement on German reparations, Germans would be sent abroad to work for the French. This is a follow-up pamphlet that appeared in October 1931, making the same claim. Although like all good propaganda it provides enough evidence to make the argument at least superficially plausible, he does make the astonishing (and completely unsupported) statement that twenty to thirty million Germans would have to be sent abroad under the Young Plan. 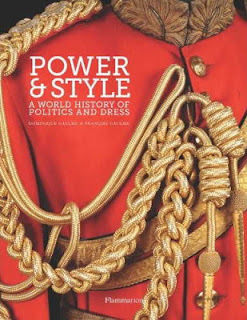 I just got an advance copy of Power & Style: A World History of Politics and Dress (Paris: Flammarion, 2012). Published simultaneously in English and French, it is scheduled to be released on 5 March 2013. 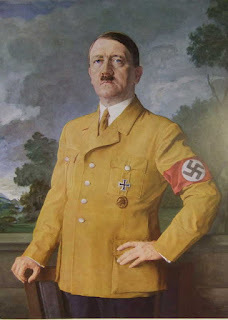 I provided an image of a painting of Hitler in uniform. The book is filled with vivid and fascinating illustrations from throughout history. ABC has a forthcoming series titled Zero Hour, with an elaborate conspiracy theory plot. There is a Nazi theme. I’ve been providing numerous images for the show, and recently lent about a dozen pamphlets and books from my collection to use as props. I’ll be curious to watch the show, which is scheduled to premiere on 13 February 2013. UPDATE: Alas, the program was cancelled after three episodes. The remaining filmed episodes may show up this summer. Germany and You was a magazine published between 1931 and 1943. I know less about the magazine than I wish. I am not sure if it was Nazi-oriented when it began, but it certainly was after 1933. Today I add scans of the full issue for January 1942. Although dated after Pearl Harbor, the issue was clearly prepared before the Japanese attack. If you have more information about this interesting periodical I would be delighted to hear from you. 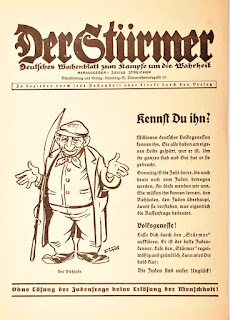 I’ve been adding caricatures to the Der Stürmer page. Some provide a clear prediction of where Nazism was headed. Take this cartoon from 1935, for example. 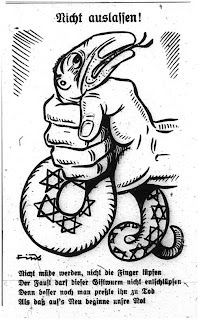 It is titled “Don’t Let Go!” The doggerel verse beneath says that it is better to strangle the Jewish serpent to death rather than allow Germany’s misery to return. 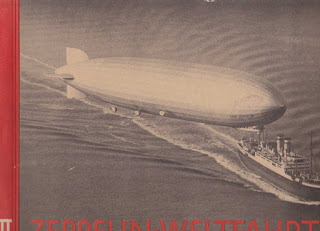 A similar theme shows up in September 1944. Titled “The Jewish Beast,” it suggests that Germany is defending itself against the Jewish threat. By September 1944, most of the mass murders of the Holocaust had already occurred. 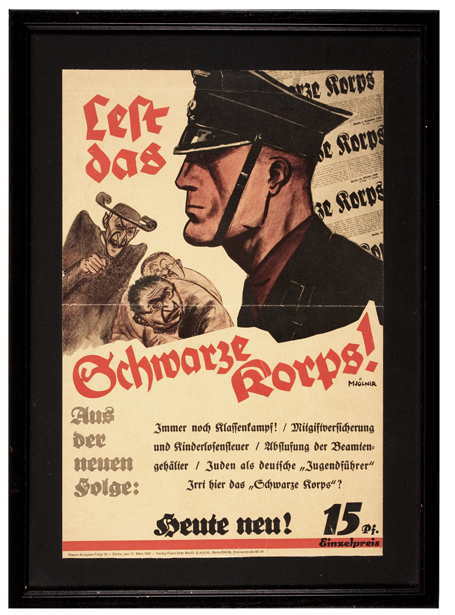 There are something over 500 examples of the Wochenspruch der NSDAP on the German Propaganda Archive. 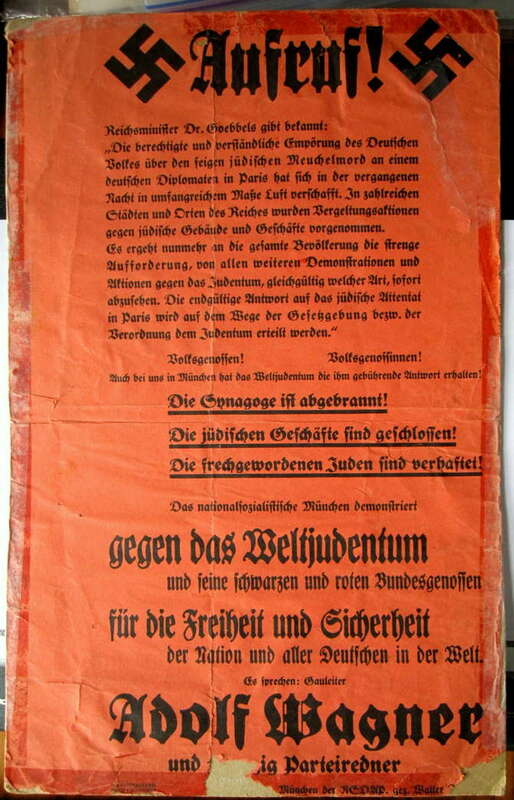 It was a weekly poster with inspiring quotations that was displayed in prominent public places throughout Germany. They were first issued in 1937 (I think), some coming from the individual Gaue, others from the Reichspropagandaleitung in Munich. This situation continued until early in 1939, when all issues came from Munich — with the exception of Gau Sachsen, which continued to issue its own well into 1941. I just bought the latest one I’ve seen, dated 6-12 April 1941. I am curious as to why Gau Sachsen kept producing its own two years longer than anyone else. Should anyone uncover the reason I’d be delighted to hear it. I’ve been gradually adding to a page of speeches and essays by the Nazi Gauleiter, the regional party bosses. This material is rather difficult to find, and as always I welcome relevant material that I can add to the site. Today I add part of a speech by Gauleiter Adolf Wagner, the party’s boss in Munich. It takes on the Catholic Church for being unwilling to accept Nazism’s claims to total power. 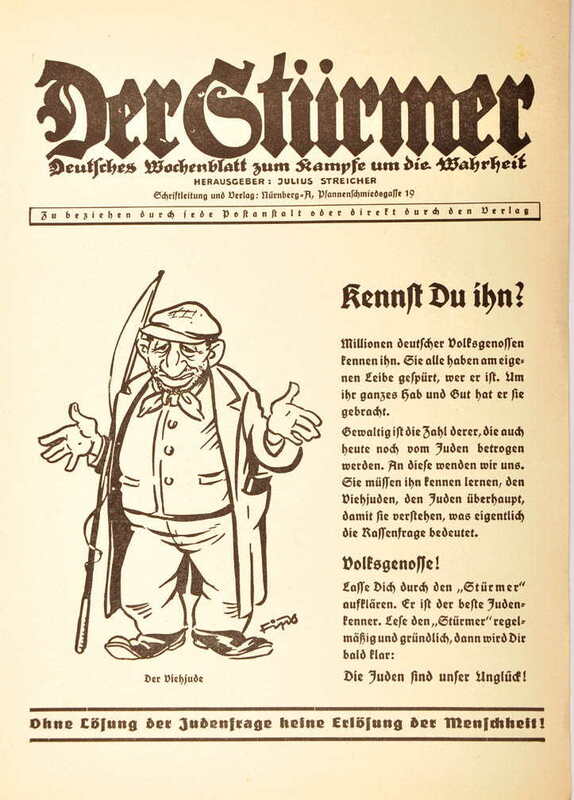 I’ve been browsing through my collection of material from Unser Wille und Weg, the Nazi Party’s monthly for propagandists, looking at what happened immediately after Hitler’s takeover in 1933. Suddenly, the propaganda system had to make dramatic adjustments to new conditions. The article I add today contains advice for new party members. They are advised to be modest and respectful of older party members who might be less educated and polished, but who had heeded Hitler’s call before the rest of Germany. The article I add today was obsolete when published. It proposes a new method of propaganda, assigning speakers to go house-to-house during the periods between elections. This was a strategy that had been used during the campaign in Lippe in January 1933, with some success. The author, Leopold Gutterer, later a high official in the Propaganda Ministry, proposes that the method be applied throughout the country. However, by the time the article appeared Hitler was Chancellor and the proposal was outdated. Anyone familiar with Nazism has heard about the annual Nuremberg Party Rallies. 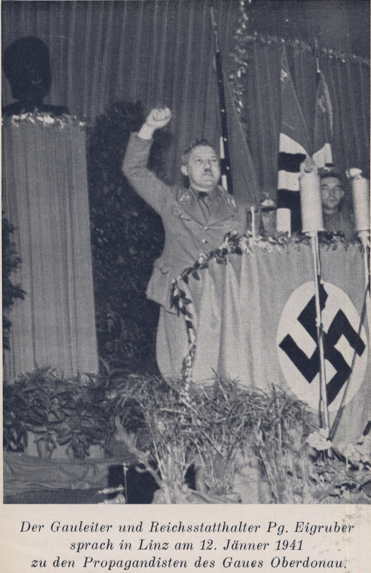 However, the regional units of the Nazi party (Gaue) often held their own annual gatherings. They were not as large or impressive as those in Nuremberg, but were still major events. 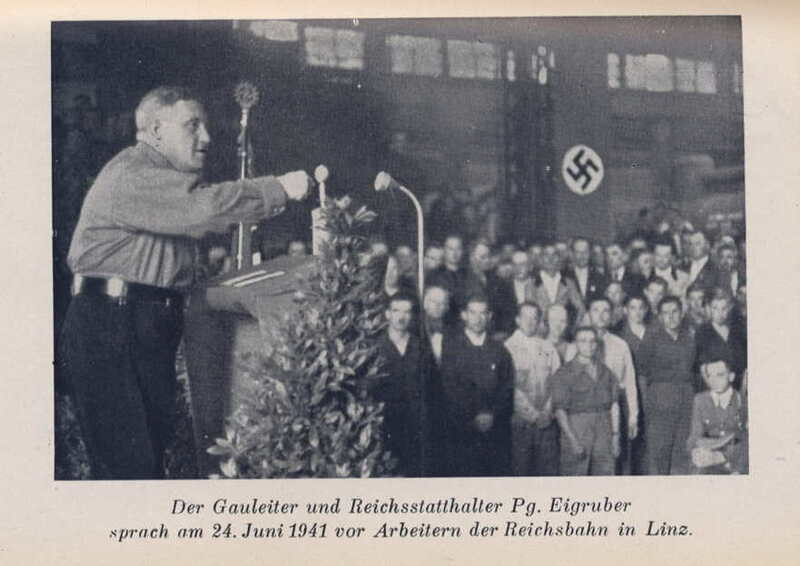 I’m adding a 1935 article from Unser Wille und Weg, the monthly for Nazi propagandists, that discusses what such Gau rallies should accomplish. 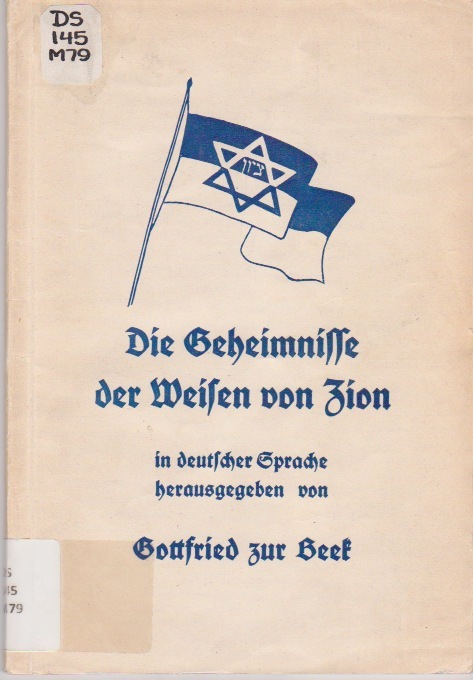 The GPA also has material from a booklet commemorating the 1936 Gautag in Niedersachsen. The Wochenspruch der NSDAP was a weekly poster with inspiring quotations issued between 1937 and 1944. I’m still trying to figure out the full story. 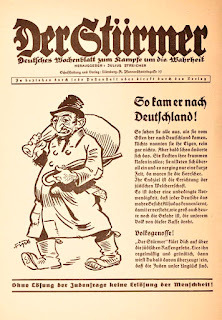 Before mid-1940, many of the individual Nazi Gau propaganda offices issued them, apparently using texts supplied from the Reichspropagandaleitung in Munich — but not all of the time. Some would release issues that quoted the local Gauleiter, for example. The same quotations show up in different areas with different dates. After mid-1940, nearly all were issued by the Munich office, but Gau Sachsen, at least, issued its own until into 1941. The total number is well over a thousand. I began with a modest page on them early in the GPA, but I kept buying more, and collectors send me images of others. The collection grew from one page to two — and now I am splitting it into more pages. The index page provides full details. Although a comprehensive listing is probably impossible, but my collection is the most comprehensive available. If you have ones I do not have, I welcome assistance in building the collection. I had a little time this afternoon so I translated another speech by Gauleiter August Eigruber, this one on the invasion of the Soviet Union. It was given two days after Hitler ordered the attack. Like most German propaganda at the time, Eigruber saw the invasion as a brief interruption in the war against England. I’d be interested in following Eigruber’s rhetoric as the war went on, but this is the last speech in the book of his speeches that I am working from. 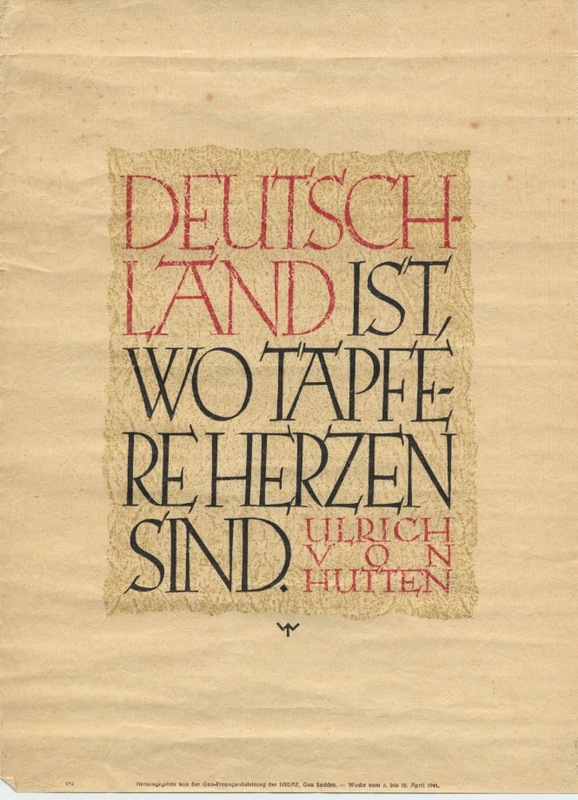 As the Austrian ANNO project continues to add digitized newspapers as the 70-year copyright limit is reached I may be able to find more speeches. I am gradually adding material by the various Nazi Gauleiter, that party’s regional bosses. This material is not particularly easy to find. I recently got a copy of a book of speeches by Gauleiter Eigruber of the Linz area (Oberdonau), and will likely add several of his speeches. Today I add a speech from January 1941 to the propagandists in his area. We tend to think of Nazi propaganda as well organized and developed, but about 10% of the citizens of his district had never ridden on a train, and many still had no electricity. They depended on battery-powered radios to listen to Nazi broadcasts. Propaganda required face-to-face contact and rather primitive tools. Gauleiter Eigruber, for example, recommends the one-two punch to knock people telling political jokes to the ground. Alexander Historical Auctions kindly gave me permission to include three images from their recent catalog. Two are of interesting posters I’ve not seen before. 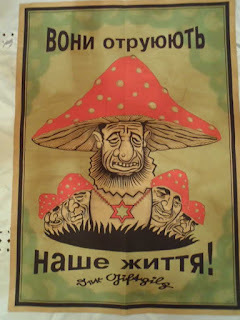 These posters are now on the poster page covering 1933-1945. 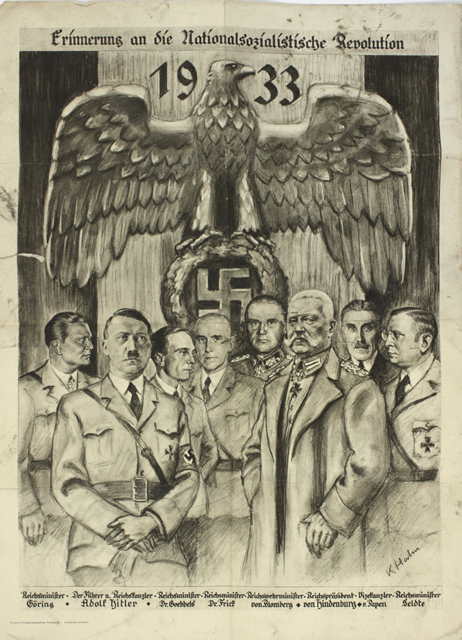 The next image is what they are confident is one of Hitler’s later paintings, dating to around 1920. There are a lot of fake Hitler paintings in circulation, but they are an established firm that knows what it deals with, so the chances are they are correct. 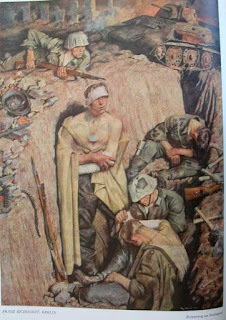 A good general summary of Hitler’s paintings from a 1998 article reprinted by Snyder’s Treasures, another dealer in such items. After some further investigation, this is what seems to have happened. The Chinese publisher of my book Bending Spines sent out some copies to a major Chinese mail order company. After those had been shipped, they got a call from a government official instructing them not to ship any more. Apparently, they were not ordered to recall the copies already released. Perhaps as many as a thousand copies are thus “in the wild” in China. It is anyone’s guess if and when the government may change its mind and allow further distribution. My book Bending Spines: The Propagandas of Nazi Germany and the German Democratic Republic has been translated into French and Chinese. 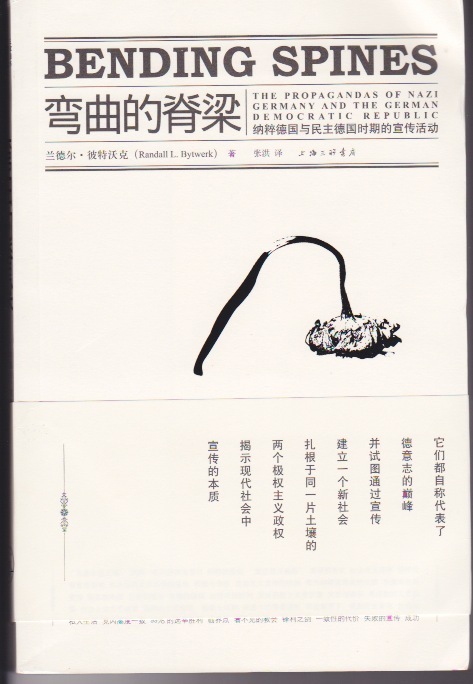 The Chinese edition appeared in July, and Chinese contacts tell me that was banned shortly afterward by the Chinese government. I’m trying to get more details, which I will post here as I learn them. 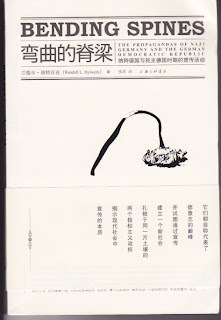 Apparently the book’s discussion of totalitarianism and propaganda did not meet the approval of the Chinese authorities. UPDATE: The book remains available in Hong Kong. 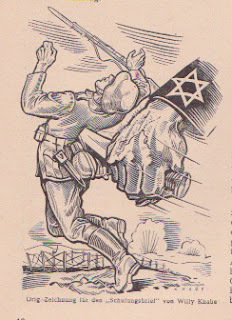 A friend of the site provided these two promotional flyers for Julius Streicher’s Der Stürmer a while back, which it took me a while to get around to adding. 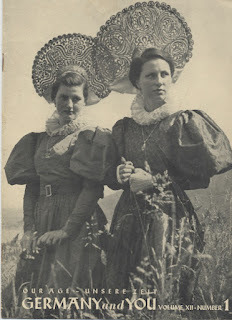 They look to be from the mid-1930’s, and I am sure were part of a larger set. If you happen to have others in the series, I’d appreciate images. For another purpose I’ve been looking through the Zeitschriften-Dienst again. It was a weekly newsletter for magazine editors with instructions on how to cover the news. I thought it would be interesting to trace instructions on the Soviet Union, beginning at the high point of Nazi optimism, October 1941, and ending in mid-January 1942. It's interesting to see how the system responded when victory did not occur as rapidly as expected. I think it is in Ukrainian, which Google translates as “He poisons our lives.” I had not realized that there was a Ukrainian translation of the book. 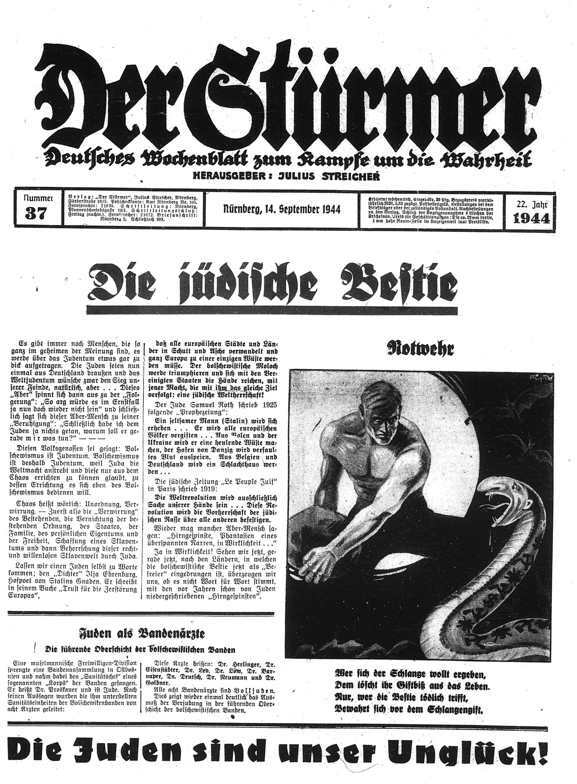 It announces a rash of meetings throughout Munich on 10 November 1938 to bring out the public to protest “World Jewry,” which is made to blame for the anti-Semitic violence throughout Germany the previous night. As best I can tell, Gauleiter Adolf Wagner (head of the party in Munich) addressed the biggest rally, with 20 party orators speaking at meetings in other parts of the city. The text is translated on the poster page. I get requests from authors who want to use material from the GPA, often for interesting and surprising projects. A recent one came from Larry Tye, whose new book Superman: The High-Fying History of America’s Most Enduring Hero cites an article in the SS’s weekly paper Das Schwarze Korps that complained about a 1940 comic strip in Look magazine that had Superman hauling Hitler and Stalin before the League of Nations. 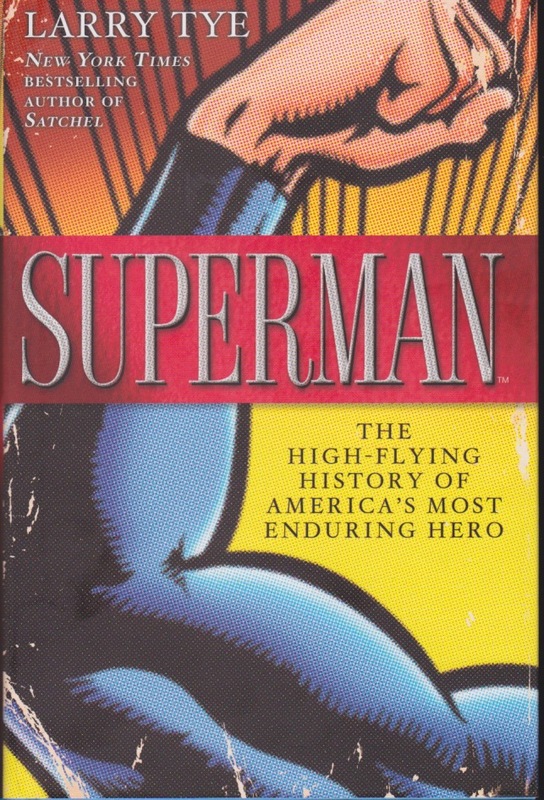 Tye’s book reviews the history of Superman, beginning with two Jewish kids from Cleveland and moving to radio, cartoons, television shows, and films. It’s a good read. 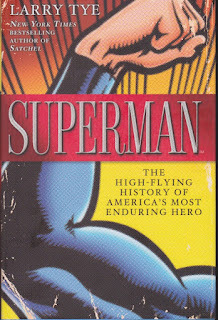 If you have any interest at all in Superman, this well-researched book will tell you things you did not know. Two months back I gave a paper at Texas A & M University’s conference on symbolic violence. The paper ended up having so many images that I can’t think of a good place to publish it, so for the time being I am making it available here. It looks at the range of Nazi anti-Semitism, examining how Nazi violence against Jews was presented as justified self-defense, whereas alleged Jewish violence against Germany was portrayed as part of the Jewish conspiracy to conquer the world. 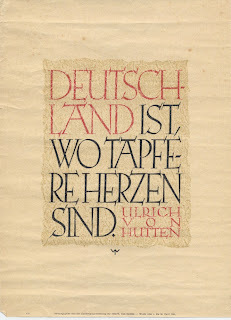 I have added several dozen new translations to the Wochenspruch der NSDAP page. These were weekly posters with inspiring quotations. Most are from Gau Westfalen-Süd, but from a few other areas as well. Several particularly surprise me. I had thought that the individual Gaue ceased issuing them after mid-1940. Nearly all did. However, Gau Sachsen continued to issue its own into 1941. Should anyone know more about this, please let me know. One more Nazi speaker directive — this one telling speakers how what to say about Italy’s “treasonous” act of deposing Mussolini. 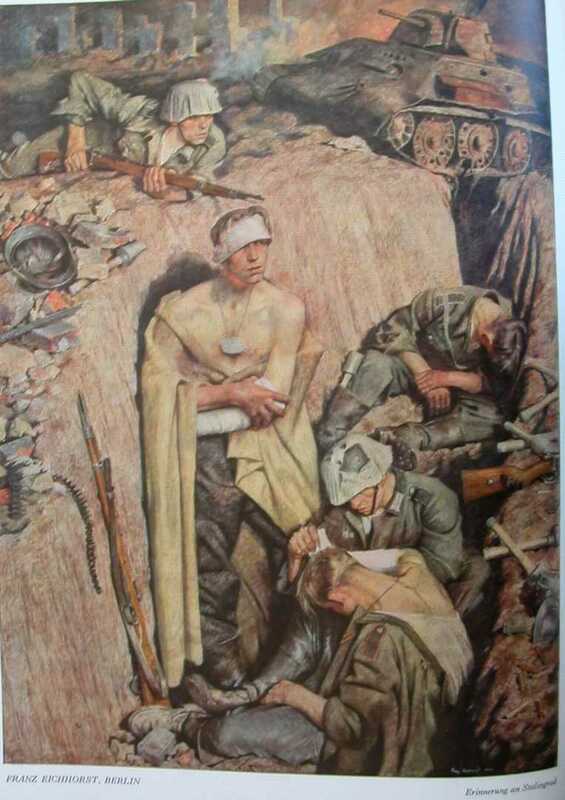 The basic argument is that Italians thought they could get out of the war by surrendering, but the material says neither the Allies nor the Germans will let them. The evidence was a variety of citations from the Allied press along with some from Nazi-occupied Europe. The same argument was used for the remainder of the war: the Allies will make wonderful promises before they take over, but forget them afterwards. They were using similar arguments in the spring of 1945. I’ve been working at the German National Library in Leipzig this week, adding a burst of material as those those who follow this blog will have noticed. Today I add two items from the Zeitschriften-Dienst. This was a weekly newsletter that went to all magazine editors with material to incorporate into their publications. First, there are guidelines from August 1939 when the German-Soviet agreements shocked the world and prepared the way for Hitler’s attack on Poland. This was a remarkable shift in German policy, which throughout the previous years had argued that Bolshevism was a great threat to the world. The material focuses on the economic benefits to Germany of the alliance and tells journalists to avoid all ideological matters. Second is the directive from June 1941. Now the emphasis is on the great ideological differences between the two totalitarian states. The invasion started well from the Nazi perspective, and at the end of the article editors are told to remember that the invasion of the Soviet Union is a phase in the greater war against England. Things turned out a bit differently. 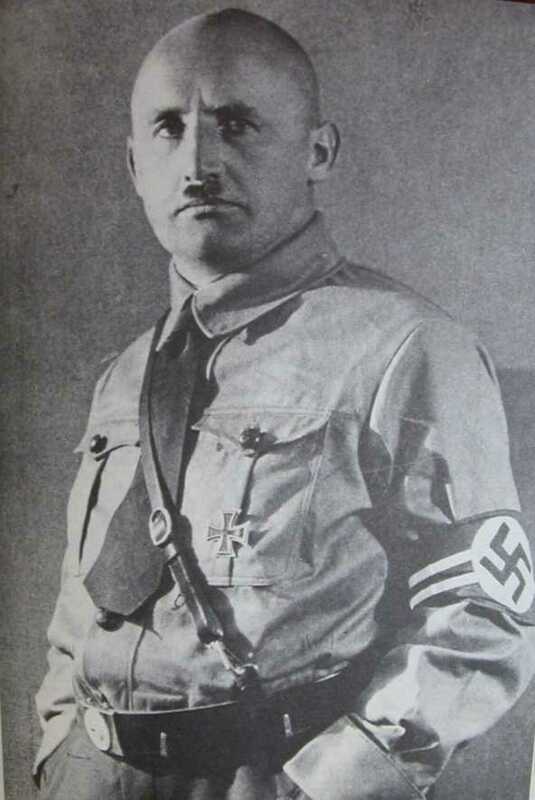 The most prominent Nazi anti-Semite after Hitler, Julius Streicher was also Gauleiter of Franconia. In that office he gave a speech on 5 January 1939 to the block wardens and cell leaders of his Gau. These were low-level party volunteers who tended to pester their neighbors with requests for donations, attendance at political meetings, etc. They were not always popular. This is something of a pep talk, telling them how important they are and how much he depends on them. He also explains that any comedian poking fun at them will face his wrath. Before the end of the year Streicher was deposed from office for rather gross misconduct. Over time I’ve been adding to the archive material intended for Nazi speakers. This material was then used by thousands of speakers to discuss the Nazi propaganda line in public meetings throughout Germany. Today I am adding two editions. The first is from March 1943, and attempts to deal with an unintended consequence of Goebbels’s February 1943 speech on total war. He had called for the elimination of luxuries, but some over-eager citizens thought they were following his instructions by insulting well-dressed women. Speakers are to say that it is still good for women to take care in their appearance. 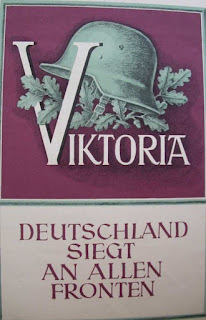 The second edition is from mid-February 1944 and expresses outrage at English Lord Vansittart’s discussion of re-educating the Germans after the war. It also discusses Allied carpet bombing. Since Einstein was Jewish, the Nazis were compelled to argue that his theory was nonsense and that he himself was up to no good. 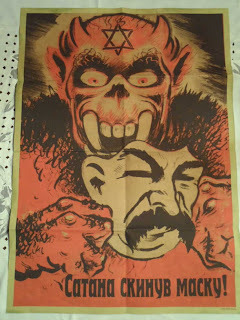 There was a surprising amount of anti-Einstein propaganda after 1933, more of which I may add over time. Today I add a 1939 article from Mitteilungen über die Judenfrage, a publication of the Institut zum Studium der Judenfrage, the most prestigious of the anti-Semitic scholarly enterprises during the Third Reich. Titled “Albert Einstein: The ‘Tourist Attraction’ of Princeton,” it says that there is nothing new in the Theory of Relativity (or if there is, Einstein plagiarized it), and that he is up to evil deeds as he abuses American hospitality. I did an interview with Alex Gallafent from Public Radio International today on Titanic, the 1943 Nazi film on the subject. It’s the program for April 12, and the interview starts at minute 24. The text of the story is available. 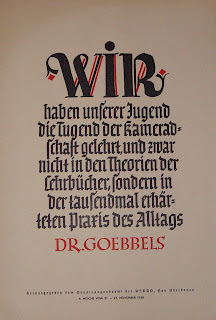 My colleague Quentin Schultze and I will shortly publish an article on the fabricated quotation by Joseph Goebbels that I have discussed in the past on this blog. I will provide details when it appears. Meanwhile, we have started a blog to follow the spread and use of the quotation — and, we hope, its gradual disappearance, although we have no high expectations that two professors will be able to do much to stop its spread. A while back Ian Garden wrote to me with the request for some high definition scans of images from the GPA for a book he was writing on Nazi cinema. As usual I asked for a copy of the book when published. 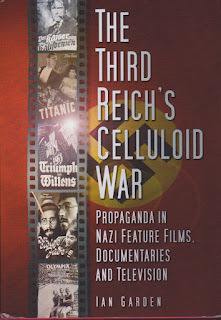 The British edition of the The Third Reich’s Celluloid War arrived by mail a month or so back. It now is available in the U.S. I recommend the book as a good introduction to the subject. As Garden notes in the introduction, he is writing for a general audience and he does that well. 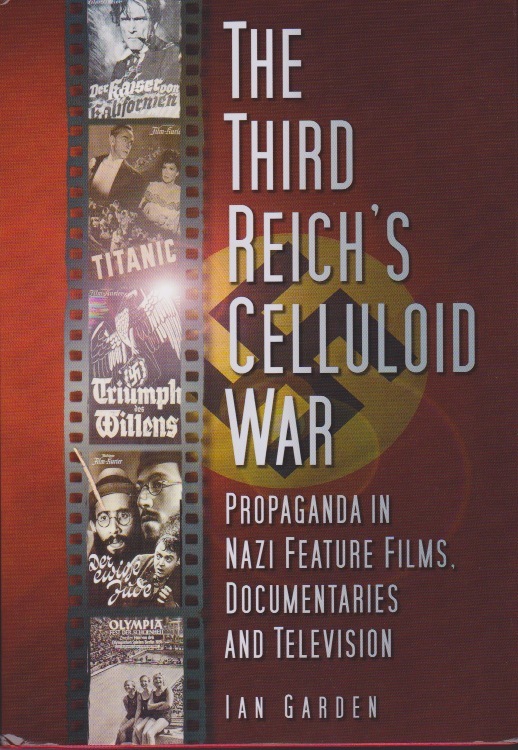 The book provides interesting information about a wide range of Nazi film. The book as a particularly good selection of images, some in color. No other book on the topic can equal it in this regard. The author has also set up a useful web site to supplement the book. There are a few matters of fact and interpretation about which I might quibble, but when my students ask me for help on where to start in understanding Nazi film this is the first book to which I will send them. There were enormous numbers of paintings of Hitler during the Third Reich. The annual Greater German Art Exhibition in Munich generally had several. 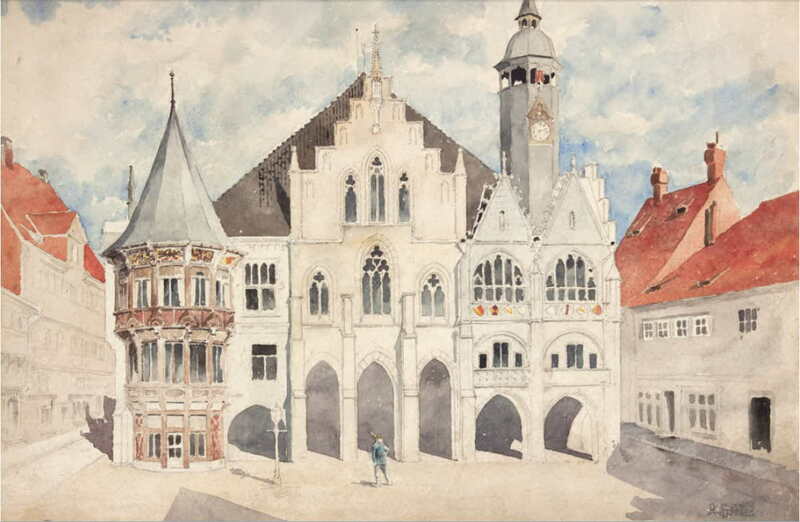 This one comes from the 1937 exhibition, and is the work of Heinrich Knirr (another of whose Hitler oil paintings is also on the GPA. 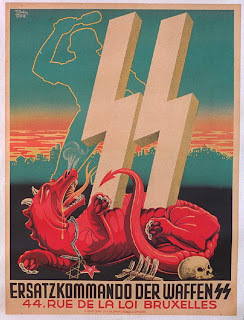 It comes from Die Kunst im Dritten Reich, the glossy art magazine published by the Nazi Party. This and other art pieces depicting Hitler are available on the Hitler portraits page. Every now and again people send me interesting books to use in building the web site. Sometimes, they are not really relevant to my interests. One such recent acquisition is a two-volume illustrated history of Zeppelins. These are soft-covered volumes with pictures pasted in. 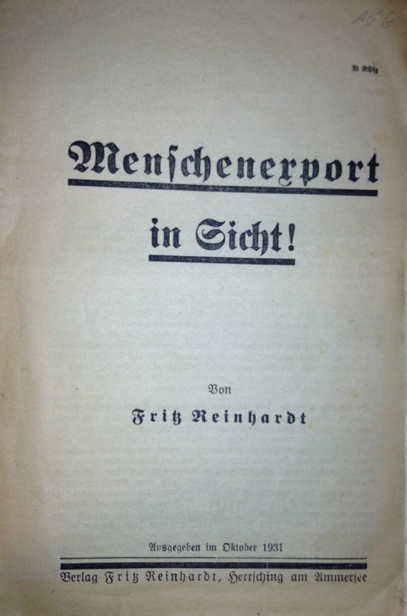 The first was published in 1932, the second after the Nazi takeover in 1933. There was a third volume published in 1937, but that I do not have. I will send them (no charge) to someone who has a demonstrated research interest in the subject. They have some value (copies sell for around $300), but I’m looking for a graduate student or scholar interested in the topic who can persuade me that he will put them to good use, not run to the nearest used book dealer. Drop me a note (my e-mail address is available on the GPA FAQ page). While looking for other things I came across this vivid cartoon from Der Schulungsbrief (#1/2/3 of 1942). 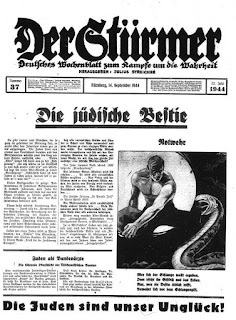 This was the Nazi Party’s periodical for “political education.” Households were strongly encouraged to subscribe. It portrayed the Nazi legend that Germany had won World War I militarily, only to be stabbed in the back by Jewish traitors in the homeland. It’s interesting that this appeared early in 1942, after the invasion of the Soviet Union had not proved as successful as expected. 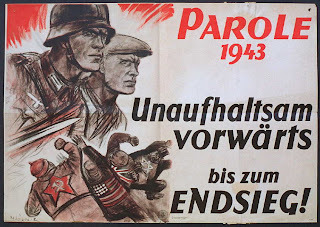 Discerning Germans by then were beginning to realize that the war could be lost — an idea propagandists wanted to discourage by suggesting that the only way Germany could lose was through treason. My current project is a study of the uses to which the Nazis put the astonishing forgery The Protocols of the Elders of Zion. That document purports to be the records of a secret Jewish conclave that discussed progress in the Jewish campaign to take absolute world power. It is popular today in the Arab world (Egyptian television apparently did a series based on it), but even in the United States there are adherents. Look over the discussion page for the Wikipedia article on the Protocols if you are curious to see some of its believers struggling to defend its authenticity. 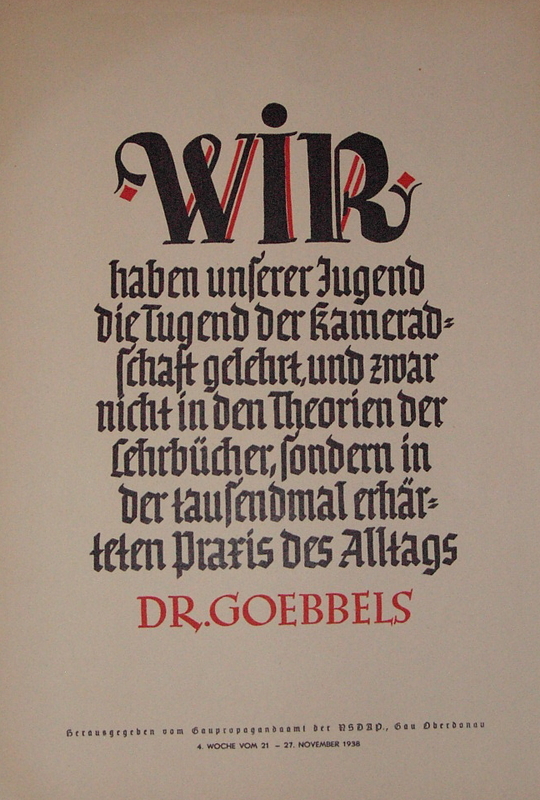 The Protocols were first published in German shortly after the end of World War I. There were a variety of editions, but the most successful was that by Gottfried zur Beek (a pseudonym for Ludwig Müller von Hausen). 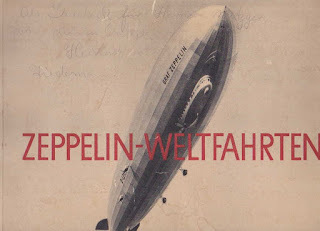 It was taken over by the Nazi Party’s publishing house and had at least 22 printings. I have not been able to determine the number of copies printed, but it has to have been in the millions. The 1938 edition shown above included a lengthy introduction that attempted to prove its genuineness that I add to the GPA today. It makes remarkable reading. The author (whose name is not given) follows the usual methods of such conspiratorial nonsense — providing a wide variety of “evidence” that does not hang together in a way that supports the case. It turns out that the painting ended up in Hitler’s personal collection and disappeared after the war. It was just found in a Czech monastery along with six other paintings. 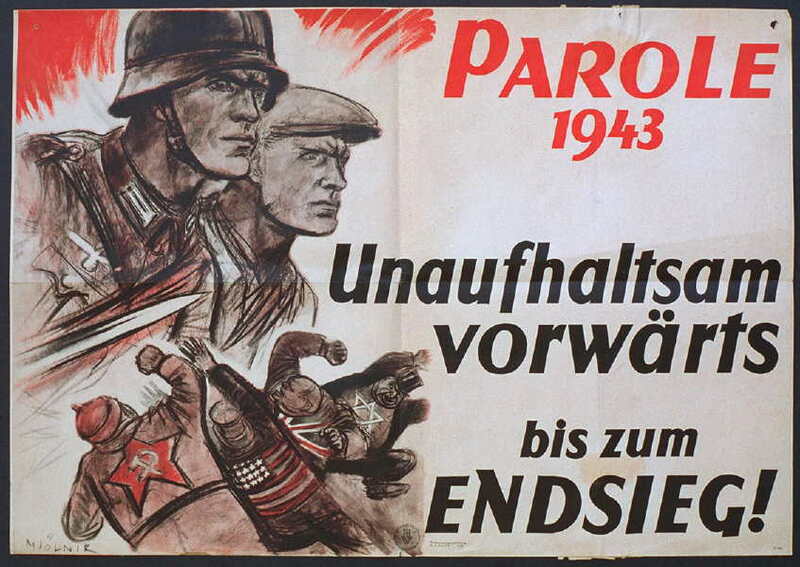 I often get requests for high definition images of material on the German Propaganda Archive. Recently, I provided some images to an amazing Chinese magazine, The Outlook Magazine. 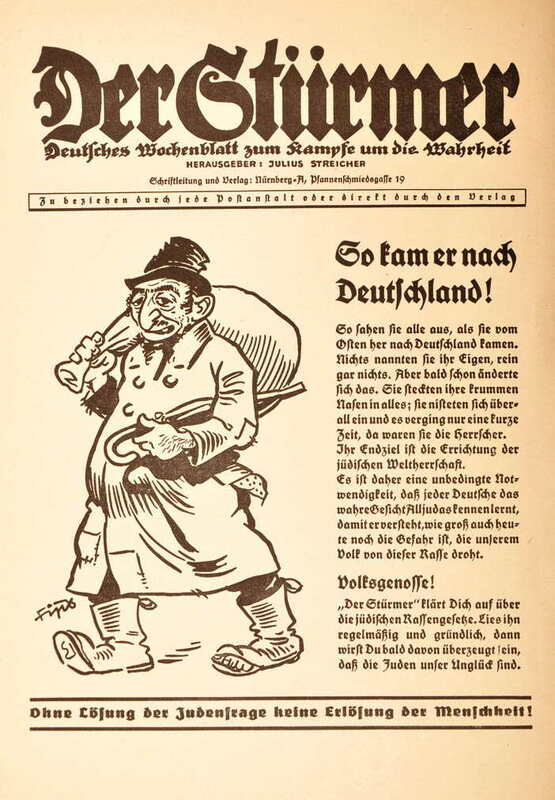 They wanted images of Nazi racial wall charts for an article on propaganda in the January 2012 issue. That is not on-line yet — I’ll add a link when they post the issue. 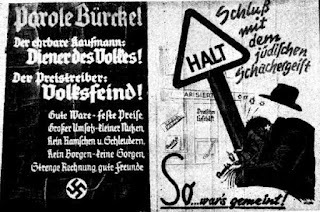 In March 1939 the Gauleiter of Vienna, Josef Bürckel, launched a campaign against alleged Jewish commercial misdeeds in Vienna. 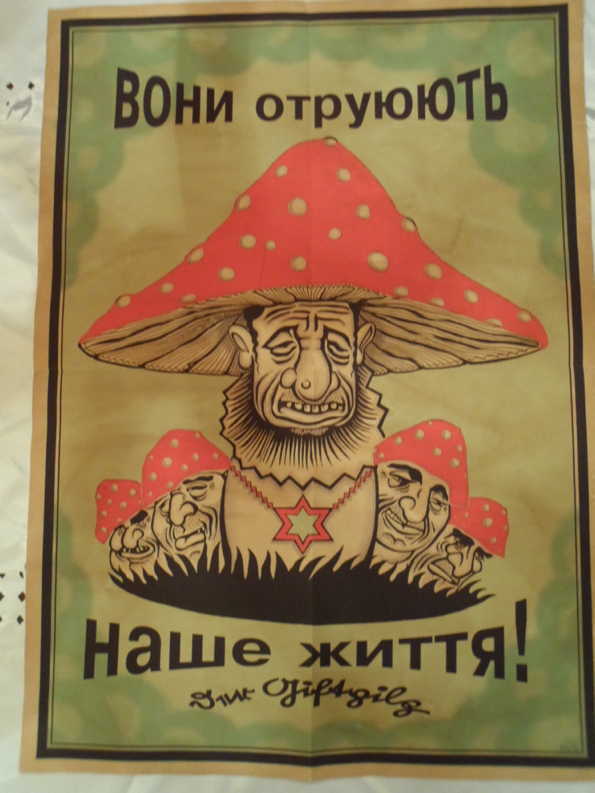 A variety of posters were issued immediately after, two examples of which are below. The first poster states: “Bürckel Says: The honest merchant is a servant of the people! He who charges excessive prices is an enemy of the people! Good products — fixed prices. Higher sales — Less exploitation. No hoarding or dumping prices. No borrowing — No worries. 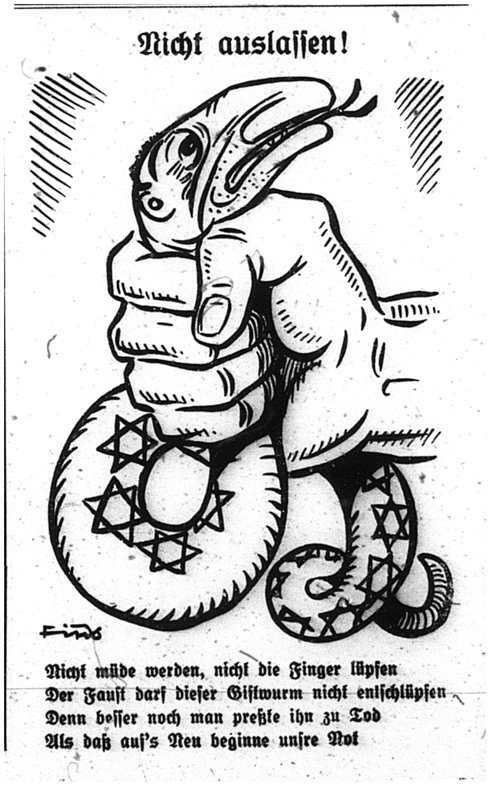 Clear bills — Good friends.” The second has a direct anti-Semitic theme: “Down with the Jewish bargaining spirit!” These were printed in Das Kleine Blatt, a Vienna newspaper. A visitor to the site provided images of two posters which I’ve added to the GPA’s page of posters from 1933-1945. The first was new to me. 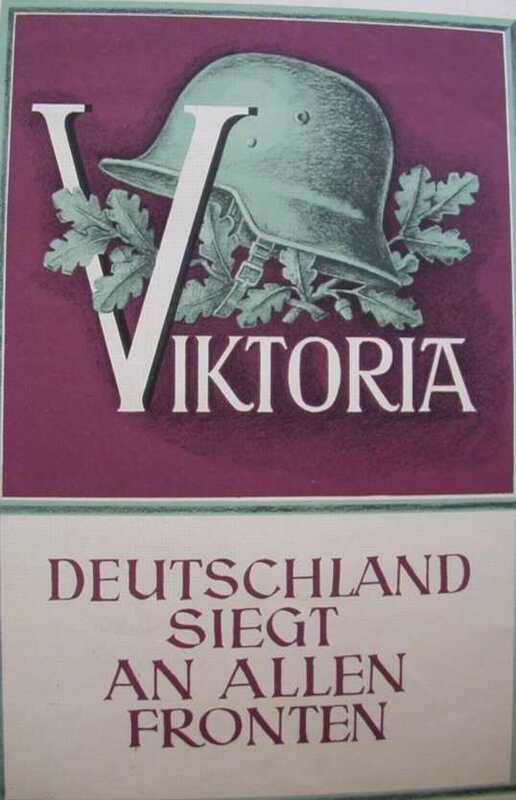 Issued, I think, shortly after the German defeat at Stalingrad, it encourages Germans to fight unceasingly until “final victory.” It would have been odd to issue the slogan for 1943 in May (during the second campaign). There is GPA page with directives for this campaign. The second is an SS recruiting poster used in Belgium. I am not certain of the date, but it is probably from 1942 or 1943.